Farmland productivity often suffers from chemical contamination, mineral deficiencies, acidity, salinity, and poor drainage. 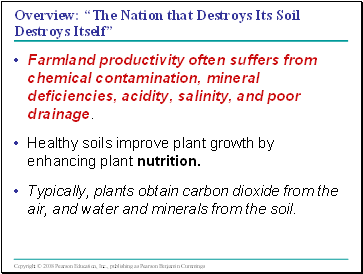 Healthy soils improve plant growth by enhancing plant nutrition. Typically, plants obtain carbon dioxide from the air, and water and minerals from the soil. 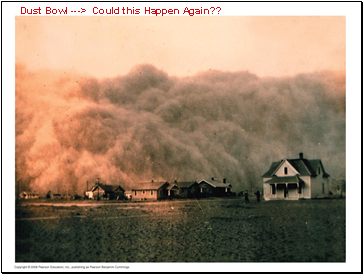 Dust Bowl ---> Could this Happen Again?? Plants obtain most of their water and minerals from the upper layers of soil. 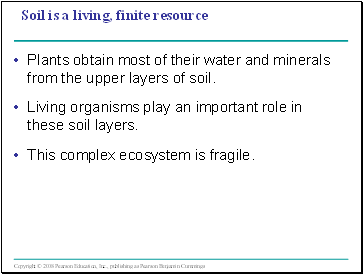 Living organisms play an important role in these soil layers. This complex ecosystem is fragile. 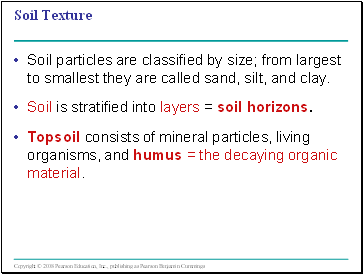 Soil particles are classified by size; from largest to smallest they are called sand, silt, and clay. 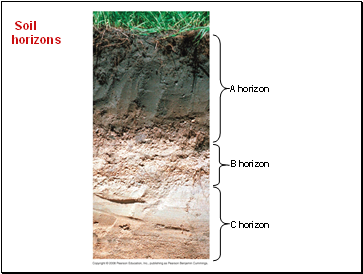 Soil is stratified into layers = soil horizons. 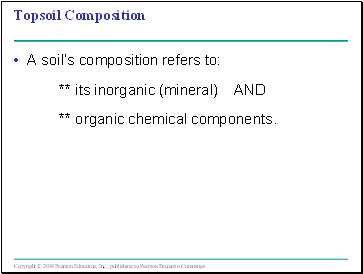 Topsoil consists of mineral particles, living organisms, and humus = the decaying organic material. 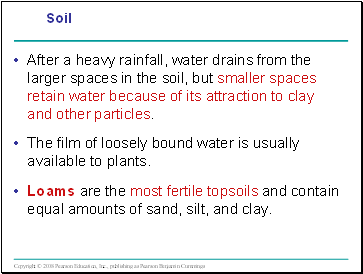 After a heavy rainfall, water drains from the larger spaces in the soil, but smaller spaces retain water because of its attraction to clay and other particles. The film of loosely bound water is usually available to plants. Loams are the most fertile topsoils and contain equal amounts of sand, silt, and clay. 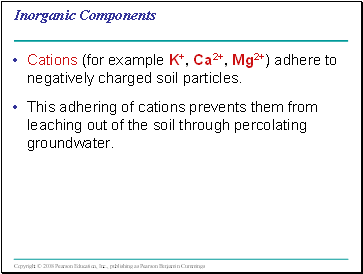 Cations (for example K+, Ca2+, Mg2+) adhere to negatively charged soil particles. This adhering of cations prevents them from leaching out of the soil through percolating groundwater. 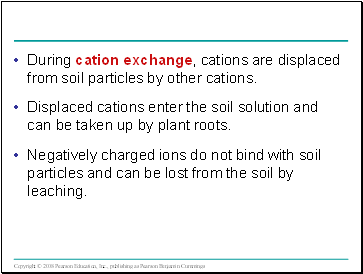 During cation exchange, cations are displaced from soil particles by other cations. 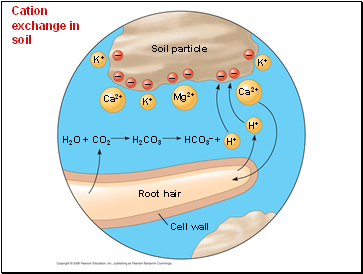 Displaced cations enter the soil solution and can be taken up by plant roots. Negatively charged ions do not bind with soil particles and can be lost from the soil by leaching.